It is my great pleasure to show off to you the fantastic personal Ratmen of Joccia force which belongs to Mark Taylor. 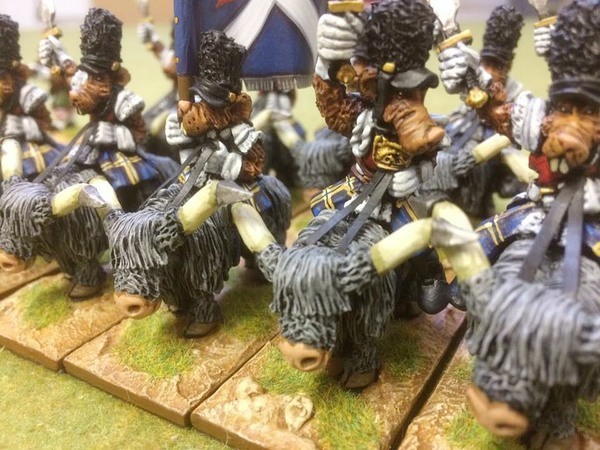 He is something of a wizard with a paint brush and takes pride in his Flintloque miniatures with which he plays Slaughterloo in unit formations. Half a dozen photos each with a story to tell. nice, we all hate him in the escape club coz he paints so darn good, mind you his forces still suffer a big defeat despite being well painted! Super to see them, really great! Thanks chaps and good figures do not mean good dice throws..such is fate.